← Weightlifting and the Word: MO Pastor Memorizes Scripture, Lifts 300 Lbs. 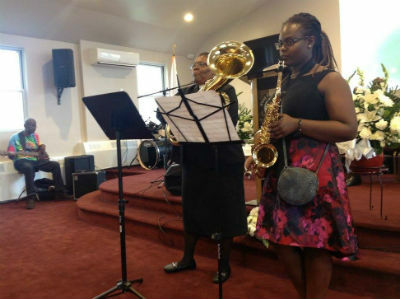 On Sunday morning, October 8, worship filled the room in the First Church of God of Far Rockaway, New York. The service was unlike any typical Sunday morning gathering for a very special reason, six months in the making! 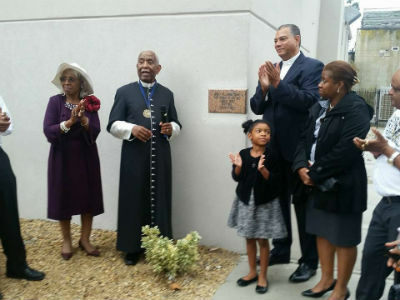 Far Rockaway had been under a full-scale renovation for half a year and, after everything had been completed, Pastor Arthur Davenport invited the congregation to join in a procession of prayer and worship. There was much rejoicing at this celebration because everyone there knew that God had blessed them in so many ways. First Church of God in Far Rockaway was founded in 1909. With roughly 200 members attending services on Sunday mornings, the church was ministering to many people across the community. Unfortunately, First Church was one of the several establishments affected by Superstorm Sandy in 2012. The water destroyed the basement, heavily damaging the area where the day care ministry had been located. The roof and side wall of the church sustained significant water damage. After the damage had been assessed, the congregation decided that it would be a good time to not only make repairs, but upgrade the whole building for safety purposes, which would include better handicap access, as well as a facelift for the building. Donations were gratefully collected and the church was able to receive some grants from other congregations—both locally and nationally—because of the damage from Superstorm Sandy. Far Rockaway held a capital fund campaign and was also able to obtain a loan from the United Church of Christ. The members of Far Rockaway are thankful for the support from the National Association of the Church of God, Concerts of Prayer, as well as some compassionate Mennonites, who prepared the church building for restoration for free! So many people were willing to share food, blankets, and supplies that the church desperately needed after the storm. The name over the church door didn’t matter—Jesus was the subject, bringing people from various church backgrounds together. The renovation process did present some challenges. The largest one was finding a meeting space so that all their ministries for youth, children, men and women, prayer groups, and Bible studies could continue serving. God used this challenge by bringing together members of the church so that the same space could be used by multiple groups. Working in close quarters built deeper relationships between people, and each group was able to flourish because of each other’s skills. The renovation not only brought the Far Rockaway congregation closer together, but it greatly improved the building. The church has a new elevator for the elderly and handicapped members. Repairs have been made to the restrooms, the kitchen is larger, and the boiler room has been moved to protect it from any future hurricanes or storms. Especially joyful worship marked the service that day. 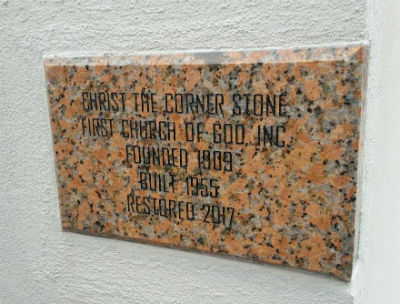 Family and friends gathered outside after the service to dedicate the new cornerstone, the architect, the general construction contractor, Pastor Davenport, and the congregation. As prayers of thanksgiving were lifted up, the rain ceased! Far Rockaway continues to be grateful for these new blessings and looks forward to new ministry opportunities. In New York, across North America, and around the world, God is on the move in the Church of God. Join the movement. Reach our world. Donate today at give.jesusisthesubject.org. This entry was posted in All Church of God, Northeast and tagged Arthur Davenport, building, construction, ecumenical, Far Rockaway, First Church of God, Jesus Is the Subject, New York, Norma Davenport, NY, renewal, renovation, restoration, Superstorm Sandy, unity, worship. Bookmark the permalink.